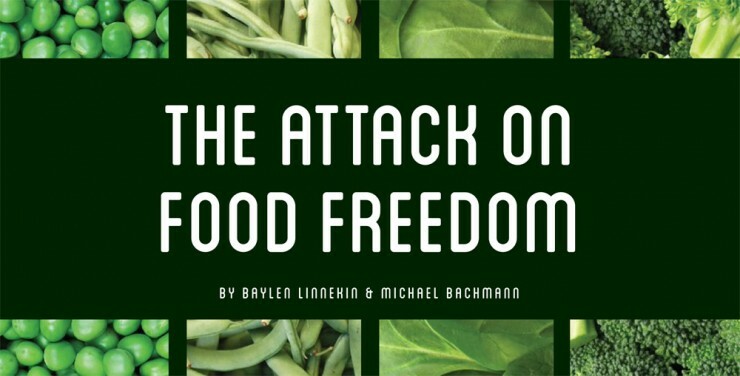 The Institute for Justice has published a report titled “The Attack on Food Freedom“, which feeds off the rising trend of saying no to excessive government regulation in the food industry. The report aims to relate current food laws to the food regulations put in place by Britain in the 18th century, suggesting that the same force that caused the American Revolution is disrupting society today. The argument seems a bit over-the-top, but the authors did a nice job of collecting a series of examples to support their points. Unfortunately, the report focuses almost solely on the problem and does little to offer a balanced perspective. Only the last page offers some possible solutions, including the cottage food laws and unsurprisingly, the one that the Institute for Justice focuses on — litigation. There’s little doubt that the report touches on issues that are deeply concerning and need to be addressed. However, some understanding of the “other side” will be necessary to reach any solutions. I want to create a new chicken fillet, to be sold as a frozen food item. Can I create this in a commercial kitchen that rents by the hour? Am I restricted on where I can sell the product? (e.g. a small grocery store, a local church, online)? I am making peanut brittle to sell at flea markets and the like. Does the new “Cottage industry law” allow me to sell at say, convince stores? thx. The laws are different for each state. Please post your comment on your state’s law page.